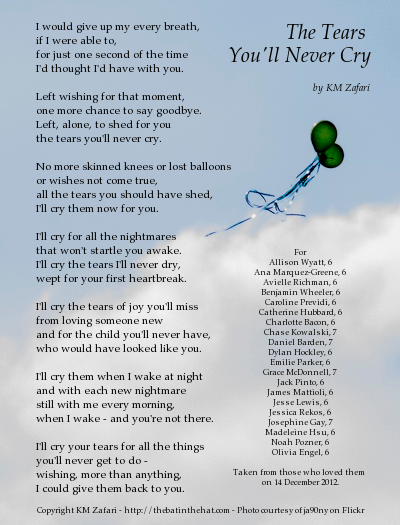 Written for the victims of the Newtown, CT shooting and their families. I’m the kind of person that has a delayed emotional reaction. Most times, it takes a while for things to sink in, which is great for emergencies. The problem is, once the sadness settles in, it takes much longer to leave. Knowing this, I tried to avoid the news over the weekend and, for the most part, succeeded. But enough of it creeped in that it devastated me anyway. I mourn for these children. I grieve for their families. I wrote this for them. It’s unlikely you can tell, but I cried the entire time I was writing it – for hours. Could their ever be anything worse than a parent’s grief? I can’t imagine so. But unlike those who looked for an explanation or turn to religion for a sense of hope, I accept that we will never fully understand the why’s we insist on asking. I had many well-crafted stanzas that ultimately found their way into the recycle bin. I wanted to convey the loss not only of the child but of their future. And it’s not just the happy times that have been stolen from them – they will miss out on every right of passage on their journey through life. I’ve spent so much time with these words, I can no longer tell if I like them or not. I expect a lukewarm reception from the (US) public, who are so fickle about poetry. But whether you like the poem or not, and whether I’ve succeeded, I wanted to honor everyone who loved those children, everyone who was robbed of their time with them. I salute those who fell trying to protect them and offer my heartfelt sympathies to everyone in pain. I hope they didn’t understand what was happening so their last moments weren’t filled with fear. I hope they met Death quickly so they didn’t suffer any more than they had to. And I hope that, one day, the families, the town, the nation, will find a way to heal. I am working on a way to use the poem to raise donations for families affected by this tragedy. I am reviewing several options, but if there are any printers, crafters, or artisans that would like to collaborate, I would be happy to hear from you. But I also strongly encourage making a direct donation to one of the funds that have been established. Checks may also be dropped off at any Newtown Savings Bank branch location – http://www.nsbonline.com/about-us/locations.aspx. Call 800-461-0672 with questions. Or you can donate online with a credit card via the United Way of Western Connecticut. “For those of you that are interested in donating to the Pozner family, here’s the link. Funds are being collected through eventbrite, and structured as tickets. Please donate any amount and please select today’s date as the day of event. Thank you so much for your generosity and may it be multiplied. A memorial has been set up by the family of the brave principal who died trying to stop the gunman. If you’re aware of any others, please let me know. how to say more than the tears in my eyes. in silent song, they fall free, without will. all of my heart pouring forth with your cries. you laid your small, velvet feet, trusting head. came your soft, subtle breath, silent sighs. I needed you, as much as you needed me. vast and endless as stars in the skies. than a love undiminished by time?